Cute three bedroom Cape offers newer roof, insulated windows, and paved driveway to the one car detached garage. Inviting enclosed front porch has great views and is the perfect place to start your day with a cup of coffee, or end it with a cool drink. Enclosed back porch, nice yard and centrally located near 17 & 81, park, amenities on Harry L. Drive, Wegmans, and the mall. Johnson City Elementary Intermediate School Elementary School, High School / Public 3 0.89 mi. Johnson City Elementary Primary School Elementary School / Public N/A 0.89 mi. Johnson City Middle School Middle School / Public 4 0.89 mi. Johnson City Senior High School High School / Public 5 0.94 mi. Crescent Academy (The) * Pre-School, Elementary School / Private N/A 0.98 mi. St. James School * Pre-School, Elementary School / Private N/A 0.87 mi. 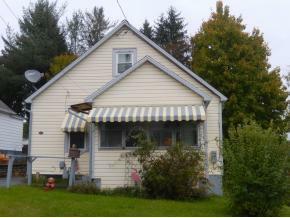 116 N. Hudson Street, Johnson City, NY 13790 is a 3 bedroom, 1 bath single family home was sold for $50,000.